Chloe and I went on a shopping expedition the other day. She needed some new clothes that weren’t jeans and t-shirts. And she really needed a pair of shoes that were not sneakers. I was pessimistic. After several unsuccessful attempts over the last few weeks to find her a pair of non-sneaker shoes she’d actually wear, I had just about given up hope. But for once, the stars were aligned. After trying on some pairs at Nine West, I was optimistic. The shoes there didn’t fit her well, but at least she had found a few that she liked. 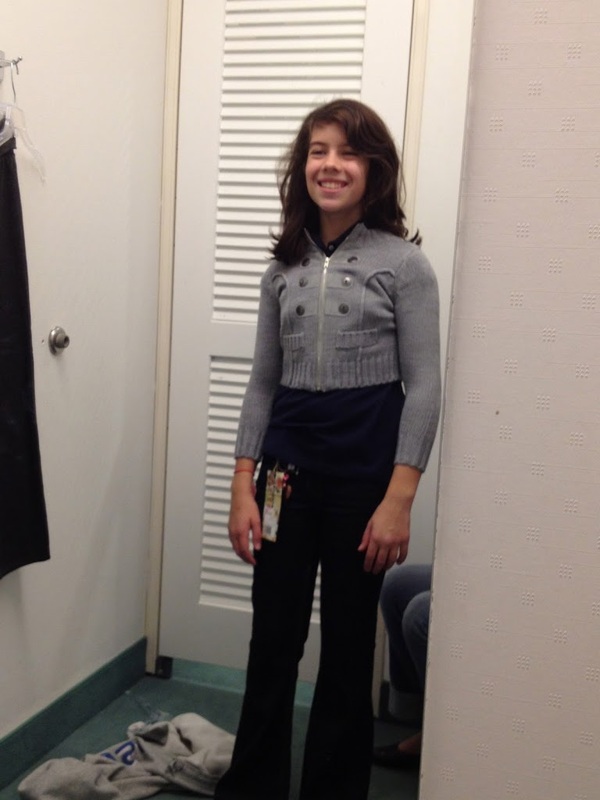 We struck gold at Lord & Taylor, where she found a pair of blue flats that looked adorable. Her first pair of adult shoes. Size 6. And then we made our way upstairs to the kids’ clothing department, where she found herself the cute sweater in the picture and a couple of other items, including another pair of jeans. I know. I just said that we didn’t go shopping to buy her yet more denim. But they’re a stylish pair of jeans and they were cheap. It’s amazing how wearing something other than jeans and a t-shirt transforms Chloe. Into the almost-11 year-old adolescent girl that she is. I may even get her to wear a skirt or a dress again – it may not happen until she gets married, but we’ll get there eventually. For now, I’ll settle for a few nice tops, a pair of shoes that she’s not allowed to wear to gym and a stylish pair of jeans.